For as long as I can remember, even before I became a certified nutritionist I've been recommending this morning habit. It's my daily ritual and something that I always recommend. 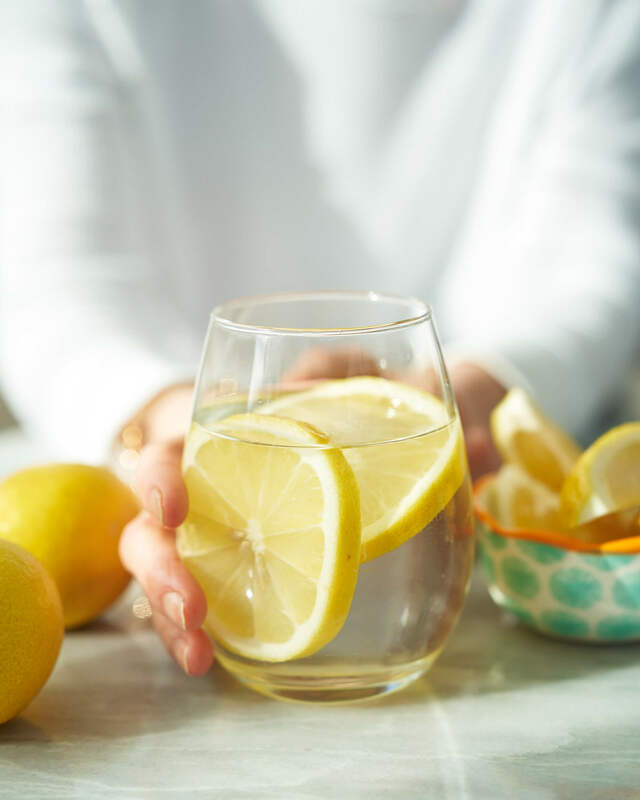 This video post is solely dedicated to the benefits of lemon and water and all the questions I get about this wonderful health habit. Drinking freshly squeezed lemon and water first thing in the morning, on an empty stomach has many benefits. Learn about them in my video and below where I've listed them for you! Be sure to watch until the end of the video where I review some of the most frequently asked questions about lemon and water from "will it hurt the enamel of my teeth", to "what temp should the water be". Lemon juice helps to stimulate your digestive fire. This means it increases the production of hydrochloric acid (HCl). The major role of HCl is to activate pepsinogen (not digest food), which now becomes known as pepsin (an enzyme) and digests protein. HCl helps to kill bacteria, parasites, viruses that enter with the food. So you can see the importance of HCl in the digestive process. Taking a drug to inhibit HCl production is totally counterproductive to healthy digestion! Here are 7 Natural Solutions to Heartburn. Sounds gross, I know, but lemon juice stimulates the liver’s secretion of bile. Bile, along with fiber, is a fantastic carrier of toxins. So when you have a bowel movement stimulated by drinking lemon and water, you are more likely to eliminate waste products. More often then not, I recommend drinking lemon and water on an empty stomach but it can also be used as a remedy for bloating. Add some fresh ginger and you’ve got at the perfect anti-bloat tea, or you might like my Turmeric Ginger Tea! Lemon water cleanses and detoxifies the liver by increasing the liver’s detoxifying enzymes. Your liver is absolutely essential to your health and well-being. It has more than five hundred functions, many of them involved with detoxification – and if you're wondering why detoxification is so important, you can learn why over here or learn more in my book, Joyous Detox! An acidic body is essentially a magnet for disease, and cancer cells thrive in an acidic environment. Lemon juice aids in making the body more alkaline, just like leafy green veggies—the opposite of acidic. (Although lemon contains citric acid, it does not create acidity in the body.) Lemon enhances your digestive secretions so that acidic wastes are eliminated more effectively. Food is medicine! I realize this sounds counter-intuitive, but the majority of people with heartburn are actually under-producing stomach acid. When you strengthen your digestive secretions with lemon and water, you may notice an incredible improvement in your heartburn. 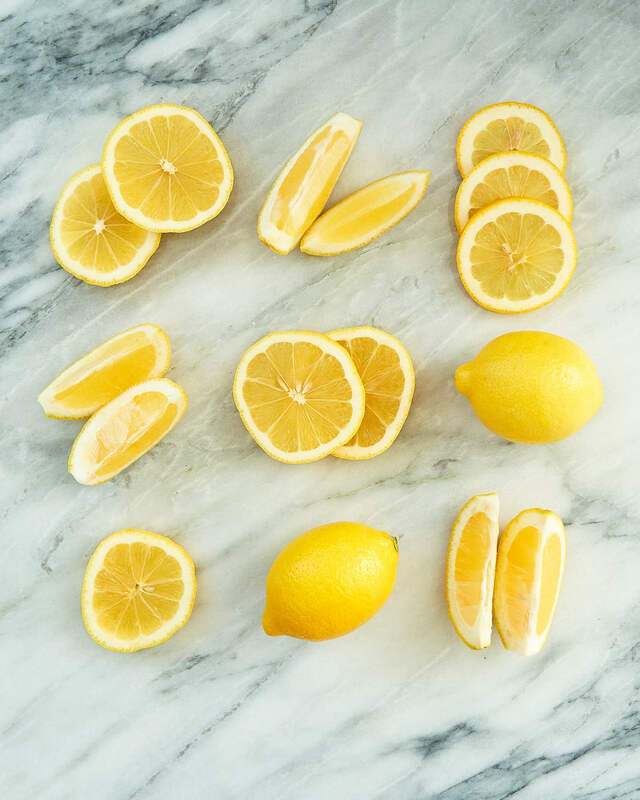 After a few weeks of lemon and water, you may notice your skin is brighter, and if you suffer from skin blemishes, you may notice a remarkable improvement. The health of your digestive system and your liver is directly related to the health of your skin because in order to heal your skin, you must start within! This is a common recommendation I give in my Eczema Healing Guide, on top of many other dietary, supplemental and lifestyle suggestions. Have a question? Comment below. What are your thoughts on using a drop of doTerra essential oil in my daily lemon water instead of a lemon? As long as it's approved for taking internally, many essentials oils are not food safe. Just wondering if Lime juice would work the same way? Also when we are travelling I take organic pure bottled lemon juice to avoid having to travel with fresh lemons.. is this OK? What if the pre squeezed lemon juice is organic and in a glass bottle. Is that okay? I'm having a hard time finding juicy lemons recently, so it's a bit of a waste of money. They're so dried up inside. Yes, that's the next best option. You mention to have lemon water first thing in the morning on an empty stomach. How long should I wait before eating breakfast after drinking the lemon water? I would be keen to know as well - until now I've waited for about half an hour, but I'm often late for work because of that! Hi Joy! In the mornings I drink my lemon and water, then I juice, then I have a tea with my breakfast. So many steps! I find myself in the kitchen all morning :) Is there any way I can combine my lemon with my green vegetable juice instead of drinking all this liquid separately? Or what about if I have my tea first (usually green tea), with half a lemon and a bit of honey? Will these combinations still be as beneficial? Yes you can definitely combine your lemon juice with your green veggie juice in the a.m. As a side note, lemons enhance the absorption of antioxidants in green tea! Thanks so much. Glad you are loving my blog and finding the products I recommend! You can definitely pre-squeeze the night before, but fresh is always best of course! Just keep in mind it is not going to be quite as nutrient-dense especially in regards to the vitamin C.
Hello, With regard to the 10 day detox, what would you recommend to eat when going out for dinner to a restaurant? Thank you! also good for preventing/dissolving kidney stones. I've heard that body absorbs cold water better than warm or tepid. Is it counterproductive to have a cup of coffee immediately after drinking lemon and water or how long should you wait before you drink your coffee (can't give it up). Thank you. Hi Joy, just found your site and saw this post and wanted to know what do you think of using the True Lemon product? I travel a lot and can't take fresh lemons everywhere. Hello There, How are you? I just want to ask if I can drink whole milk or have my cereal w/milk after I drink my lemon water? Or should I wait a few minutes to half a hour or more?? Would it cause a bad reaction when lemon juice and milk are combined? Can I get sick?? I'm sorry I'm just concerned about the reaction of lemon with whole milk and other types of milk such as..... almond/coconut milk. Hoping you can help me pretty please :) :) Thank you for your time, it means very much. what do you recommend for swollen ankles and other water retention. That really depends on the root cause -- ie. pregnancy, inflammation, kidney problems. Even though it may sound counter-intuitive, drinking water helps your body retain less water. Usually your body will hold on to more water if you have too much sodium in your diet and too little hydration from water. Additionally, it can also be due to weight gain which is why many pregnant women suffer from it. It's hard to give advice without knowing your full health history but I hope that helps! Drinking more water in general has changed my life! What I noticed almost immediately was just a big boost in my energy levels. I was so inspired I wanted to contribute some how in a fun way, so I made a funny and simple tee shirt with a play on words that I thought others might like. If anyone is interested in checking it out, please just click on the website I've linked. Thanks! can I drink lemon water all day everyday without repercussions? Thank you for the brilliant video, it helped clarify some doubts. Hi Joy, I've been having lemon-water mornings for quite some time and am loving the benefits. I just watched this video and wanted to let you know that I spoke with my dentist about it and was given the go-ahead for the lemon water, but told NOT to brush my teeth immediately afterwards. Brushing right away contributes to enamel erosion and it's best to wait 30-60mins. Eating cheese after an acidic meal or drink can help to neutralize it. How long should I let the lemon sit in the water before drinking it, and just to be clear is it put in by slicing it up, or should I squeeze the juice into the water? Can I just have a pitcher in the refrigerator overnight with water and lemons? Thank you for any information, I really want to give this a shot. You talk about hydrochloric acid. Citrus does tend to have a lot of acidity. Wouldn't that actually make it something to avoid, especially for people with a fair amount of heartburn and acid reflux? Wonderful video reagarding lemon and water. I would like to know when a person start drinking lemon and water. Approximately how soon will they notice glowing skin? Hello, I love this site. I do like to drink lemon water but usually in the afternoon or evening. Will I still get benefits? Yes definitely! Thanks for stopping by! What a great post, I had no idea that lemon juice had a direct link to the liver and helps elliminate toxins. Thanks for the great insights here. Regarding the lemon and water, could I also add a small amount of stevia or natural local honey to the drink? Does lemons work as well when you just slice them and leave them in water or is best to squeeze it? I have oil on the water after a poo, loose bowel after eating. I drink lemon watering drp I drink lemon water every morning, I wait 20 min then I have my coffee. Is drinking coffee undoing the benifits of drinking thermonuclear water? Hello, I take a preworkout supplement (with caffeine) when I first get up in the morning, how long should I wait after drinking my warm lemon water before taking my preworkout powder and exercising? Great video,lots of good info,lemon water,how much lemon to how much water?,thanks. I take synthroid first thing in the morning on an empty stomach and then have to wait 30 min before eating. Can I drink the lemon water during these 30 min or do I have to wait until after? Never saw an answer regarding whether LIMES can be used in place of LEMONS? Thanks! Hi Joy & Team, I love watching your segments on S&C! I have been drinking lemon water in the morning for a while now. 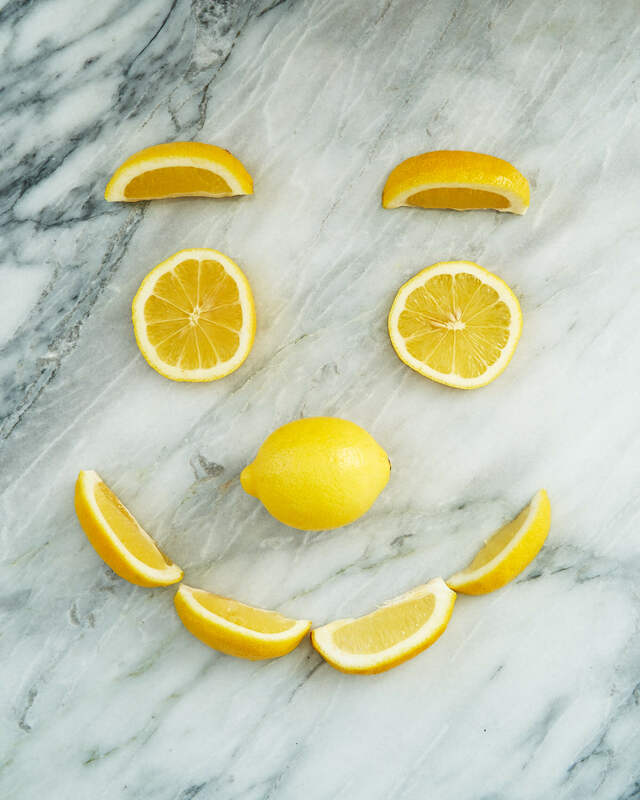 However, I am still uncertain on the following and wondered if you would please shed some light: - Should I always opt for organic lemons, or would using regular lemons mean drinking some of the toxins from the rind? - Any concerns with using too much lemon in one cup of water? With using, say, half of a larger lemon, sometimes my lemon water tastes tart enough to be lemonade. - Do I still reap the benefits of drinking lemon water every other day or even two days a week, instead of everyday (as I have been doing)? Thanks in advance! Is it okay to add organic raw honey to your lemon tea? is it o.k. if i squeeze a few lemons and keep them in a jar in the fridge, or do i have to squeeze one fresh lemon every day? I love lemon in my water. Everyday i drink it. I cut up a slice and put it in my water and just keep adding water to my cup with same lemon for two days then switch new slice. I have been doing so for the past year. I havent been sick(well not as sick) flu, colds, etc.... Just wondering if its ok to drink it everyday as i am doing.? Hello. I found your video very informative, and with all my digestive issues I'd like to try lemon water in the morning. I have one question though. Can I take the lemon water with my thyroid hormone pill (I take this pill every morning on an empty stomach)? I have to wait 30 min after taking my pill before I can eat. I don't want to take the lemon water, then wait 15 min to take my pill. Any thoughts? Thank you! Hello I was wondering if it's ok to use frozen lemons juice! I always get a huge bag of organic lemons from my mother in law's tree in her backyard, when we visit. I find I could never use all the lemons before they go bad so I started freezing them in ice cube trays. If it's ok, how many frozen lemon cubes would you recommend for 10oz of water? Thanks in advance for your response! Thank you, for the information on lemon juice but my question is it alright to use the lemon juice in the little lemon looking container or is that the same as you had mention. How long should you wait to eat or drink after drinking lemon water in the morning? It is so refreshing to see someone who truly cares about the health of people and are not making us go through a sales pitch to get great information. Thank you so much. One thing I wanted to ask. Can you add the ginger to the morning lemon water or should I do that later on. Hello Joy! I have a question- is it ok to prepare a bottle of lemon and water or vinegar and water ahead of time like a day before and store in the fridge so its easy to grab in the morning? Jane. You mentioned brushing teeth after having lemon water if someone is concerned about the acid attach. Best approach is to rinse mouth with warm water. You should never brush your teeth directly after having anything acidic for at least 20+ minutes. Your mouth will be in an acidic state and this could cause you to move the acid around on the teeth creating minute etching in the enamel, thereby weakening teeth and eventually making teeth susceptible to breakdown. Is it safe to drink lemon water every morning while pregnant? Is lime juice as good as lemon juice? The jar you were holding up was how many ounces? How soon after I drink lemon water in an on empty stomach can I have breakfast ...can it be immediately ?? Perfect! All the best Daniel! Is lime juice just as good? Good Morning. I regularly drink lemon water on an empty stomach, however I also drink Miralax and Essiac Tonic in the same cup. The product also suggest on an empty stomach. Is this okay to do? Definitely not all day, first thing in the morning is ideal. Hope that helps! How long do I wait to drink something else after after drinking my lemon water? I have had a skin condition for over six years that has been diagnosed as scabies to folliculitis. All blood tests have come back negative. And all prescriptions including Ivermectin have only worked for a short time before I have to start another dose. Once I stop the Stromectol the breakout resumes. I have even tried using a near-infrared light, but that also has been a temporary fix. Is there a food that I may consume to kill whatever is eating me alive from the inside-out for all these years? I even feel a piercing sensation in my eyes and noticed that my eyesight has been affected. Most recently I started fasting one day a week and drinking two gallons of water a day. Is it ok to drink lemon water immediately after drinking g coffee? I drink coffee in the morning to wake me up and when I am done that I drink lemon water through out most of the day. Hi can I make a big jar of lemon water and keep in the refrigerator for the convenience or do I have to use fresh lemons every day? Hi Joy! Is it okay if I drink my coffee after the lemon water or the other way way around? I'm usually short short on time and way too rushed to take my time properly. WILL FRESH LIMES BE AS EFFECTIVE AS LIMES? Joy How long after I drink lemon and water on empty stomach can I drink or eat my breakfast? It is crunch time in the morning. Starting today (11 Mar 2017) each morning I plan on drinking a warm glass of water with lemon hoping it will keep my sugar level within a normal range of 80 to 140. Today my sugar level was 157. After I drank a glass of warm water mixed lemon, two hours later my sugar level was 87!! Great! Thanks for the great info. Can you add a little honey or organic sugar to lemon and water and still get benefits? Second, is lemon, honey, salt and spring water a good substitutefor an electrolyte replacement?? Thank you! Hi Douglas, yes you can definitely eat after drinking the lemon and water. It's best on an empty stomach and then wait a little bit... 10-20 minutes. When do we eat after taking this drink? You can eat right after, maybe just leaving about 5-10 minutes or so, but it's not necessary. If I freeze and grate the lemon how much should I use? can we have brakfast immidiately after drinking the drink? can i pre make the lemon water in a closed container for the week. How long after I drink my lemon water in the morning, should I wait to have anything else to eat or drink? I have never been sure about that. Thx. Preferable hot or cold water? Hi, loved the lemon water video. After you drink the lemon water are you not supposed to eat for a certain period of time to let your body absorve it? I usually have chamomile tea in the morning, is it ok to drink it right after the lemon water? How many minutes after drinking my lemon water can I have a cup of coffee? How soon after drinking warm lemon water must you wait before eat breakfast? One half hour or one hour? Idrink one cup of hot water with a squeeze lemon every morning. How long should I wait to take my pain medication which is supposed to be taken on an empty stomach also? What do you think of a mixture (blender) of whole lemons and ginger? I plan on trying this and adding to my morning water. How long after drinking my lemon water should I wait to eat brakefast? How long should you wait to have coffee with milk or breakfast after taking this in the morning ? Hi, once you have had a hot water and lemon drink. Do you need to wait a while or can you have a cup of normal black tea n milk 5 mins after or even a few minutes after???? Hi; I was just wondering how much lemon I must squeezing into the cup in the mornings? Im currently using half a lemon. Just wondering, I noticed you didn't squeeze the lemon you just dropped it in. would squeezing it change anything??? How long should a person wait after drinking the warm lemon water before eating or drinking beverages including coffee. I'm a one a day cup of coffee drinker. I workout first thing in the morning and drink a ton of water when I work out. Will I still get all the benefits if I drink lemon water after my workout and before my breakfast? Just wondering if you have to wait any length of time after drinking the lemon water in the morning, before consuming anything else. Would this help with acid reflux and G.E.R.D.? Does lemon water help dissolve kidney stones? I read somewhere that mixing 1/2 cup concentrated lemon juice with 7 cups of water would be good for kidney stones?? Is concentrated lemon juice the same as lemon extract? How soon after drinking lemon water in the morning can I️ drink my coffee? How long do you wait to eat after drinking lemon water? What is yhe best H20 to drink? Bottled, alkaline, purified, spring.???? Is using Lemon Essential Oil in warm water the same as lemon juice? Thank you for invaluable advice. My husband bought me lemon in a plastic bottle so now I can explain to him why it's better to use the "real" thing! Great in formation. Thank for sharing! How long should I wait after drinking lemon water to have my coffee? The longer the better but 15-20 minutes is a good amount of time to wait. Hope that helps! Can the fresh lemon be added to my sugar free juice pac? Or must it be plain water? Thanks! -Can I add 1 Tbs of Honey to a warm Lemon water in the morning for weight loss, please ?! - How long should i stay after drinking lemon water to get a cup of coffee, please?! What do you use when traveling and squeezing a fresh lemon is not possible? When substituting Apple cider vinegar, how much do you add to your water or tea? How long do the lemons need to be soaking in your water before it’s ready to drink? You did not address if bottled water can be used. I Do not have filtered refrigerated water but bigot to e faster. Yes you totally can. To get the most benefits I do suggest on a near-empty stomach ideally. You could totally do that Lin! Hi Tana! You posted your question on this post: https://www.joyoushealth.com/27291-blog-these-perceived-health-habits-made-me-unhealthyIf you scroll to the bottom you'll see my answer. Hope that helps! Do you suggest lemon water only once a day on an empty stomach or is throughout the day ok? Ideally, on an empty stomach and typically the easiest time of day is first thing in the morning.